Prominent & Leading Wholesale Trader from Mumbai, we offer finger print module gt-521f52, 4 wire resistive touch screen mux, finger print module gt-511c3, arduino compatible voice recognition module, jpeg color camera serial uart interface module and micro module. Compatible Devices Aurdino, 8051, PIC, AVR, Raspberry PI and all other Microcontrollers. - High accuracy and High speed finger print identification technology. - Downloading finger print image file from device. - Reading & writing finger print template(s) from/to the device. 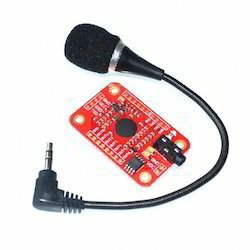 - Simple Uart & USB communication protocol. - 200 numbers of maximum finger print. 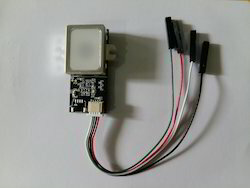 Description: This Serial JPEG Color Camera module is a compact size, low power consumption, and stable operation. 5.0V DC Supply. UART: Up to 115200bps for transferring JPEG images. The camera uses the advanced Omni Vision OV7725 VGA color sensor JPEG CODEC for different resolutions. 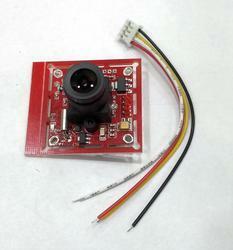 The camera also features down sampling, clamping and windowing circuits for VGA, QVGA, and no need for external DRAM. The use of the Omni Vision CMOS VGA color sensor makes this a low powered consumption unit. The interface of this module is using RS232 protocol. If you are planning to use it with MCU UART then add a MAX232 Interface between this camera and your MCU so that conversion can be made between UART level of MCU which usually works at 5V and RS232 level of camera. 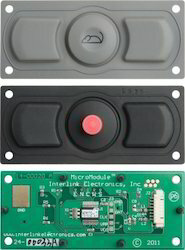 Designed for OEM integration, Interlink's MicroModule pointing solutions The Micro Module is a finger-actuated "mouse" pointing module that provides complete 360-degree directional control and accurate speed control simultaneously. Users control direction by applying pressure in the direction of the desired movement and adjust the speed by altering the amount of pressure on the device. 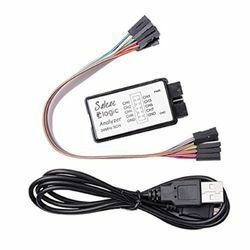 Micro Module is ideal for computer cursor control in rugged mobile computers, hardened keyboards, navigation systems, machine control panels, pan and tilt controllers, motion controllers, CNC controllers and medical control equipment. It's a durable, maintenance-free "miniature" solution that works well in tight spaces and is capable of delivering "mouse" lifetimes of more than 3 million actuations. An integrated sealing rib also makes it possible to seal MicroModule into a system during installation. Directional control is achieved by applying pressure in the direction of desired movement. Speed is controlled by altering the amount of applied pressure. The result is smooth cursor movement in any direction, from a precise crawl to a screen-crossing zip. VersaPoint technology has no moving parts to break or wear out, thus delivering reliable, trouble-free cursor control. The device is available in both USB or PS/2 versions and three connecting cable options. For prolonged exposure to fuels, oils, solvents and aggressive fluids we offer a robust keypad option. The most basic FSR consists of two membranes separated by a thin air gap. The air gap is maintained by a spacer around the edges and by the rigidity of the two membranes. One of the membranes has two sets of fingers which are interdigitated and electrically distinct; each set connects to one trace on the tail. The other membrane is coated with FSR ink. When the two layers are pressed together, the FSR ink shorts the two traces together with a resistance that depends on applied force.